Received a Certificate from Bikram’s Teacher Training and taught 75 classes and a minimum of 6 months. Completed an internship at their home or neighboring studio that encompassed what they learned at training and applied it to teaching in a studio setting. Meets the same criteria as the yoga alliance for validation. 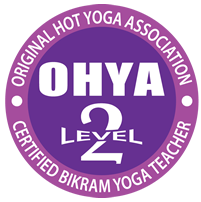 Level 2 or Experienced E-Certified Bikram Yoga Teacher. Completed all requirements from Level 1. 5 years of teaching minimum and taught 1500 classes. 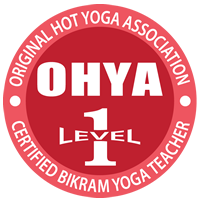 Maintained recertification every 3 years from Bikram and/or maintained 30 hours every 3 years of furthering education in The Orignal Hot Yoga lineage. Approved teachers for furthering education listed on our site. Level 2 Credentials can be added to your profile by clicking the edit gear in your membership profle. After adding your credentials in your profile please submit for approval to the OHYA executive team. Level 3 Credentials can be added to your profile by clicking the edit gear in your membership profle. If you have completed these requirements please use the form below to let us know. Upon review we will send a link to pay for level 2 status. If you have completed these requirements please use the form below to let us know. Upon review we will send a link to pay for level 3 status. Have you completed all requirements from Level 1? Do you have 5 years of teaching minimum AND taught 1500 classes? 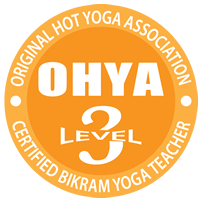 Have you maintained recertification every 3 years from Bikram and/or maintained 30 hours every 3 years of furthering education in The Original Hot Yoga lineage? Please list you’re the studio name, owner and email of your current studio owner for verification. If you are a studio owner, please list that here. Have you completed all requirements from Level 2? Have you maintained further education requirement every 3 years? Have you completed consistent teaching for 12 years AND taught a minimum of 3000 classes? Please apply below to teach classes that qualify for the furthering education requirement for the OHYA. We will contact you if approved and once approved, , list you on our site as an approved teacher for further education. We will also help you promote your seminars that provide further education to our community. We will contact you if we have questions or need further clarification.